On April 1, 1988 the partnership between Canfor Corporation and Oji Paper Company was finalized and the mill began an extensive four-year modernization and expansion program. This project would cost $1.3 billion and required the skill of over 1,800 contractors. So many extra people were on site during this period that a camp was constructed just to house them all. 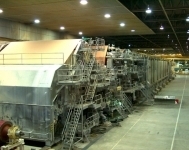 By 1991, a newsprint division had been added, the kraft pulp division had undergone major upgrades, and over $100 million had been spent in the installation of the best proven environmental protection technology available. The result was Canada's most modern mill, with the lowest emissions in the country. 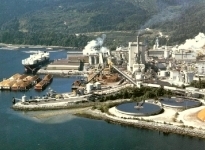 Today, Howe Sound Pulp and Paper remains an industry leader in product quality and environmental protection. In 2009 we will be celebrating a century of operation at Port Mellon, and although the path traveled was often bumpy, with twists and turns, the mill and the people who ran her persevered. In the end, we were rewarded with an environmentally responsible operation that will remain part of the Sunshine Coast's economic foundation for years to come.